The children were fascinated by your website the other day, especially seeing the photographs of the village and the school as it used to be. Thank you for the hard work you have put into it, as it is a really wonderful site. I am astounded at the information on your site and it surely must be one of those sites that are rare but yet give out so much history of the local villages and people in them. This is all so important because otherwise it all gets lost in the annals of time. Just been looking at your web site again. Absolutely top class and what an interesting amount of news there is on it. I will in slow time look at all the stuff on the web relating to West Hallam, mind blowing. I had to write and say how fantastic your Mapperley History site is. I loved it - such hard work. 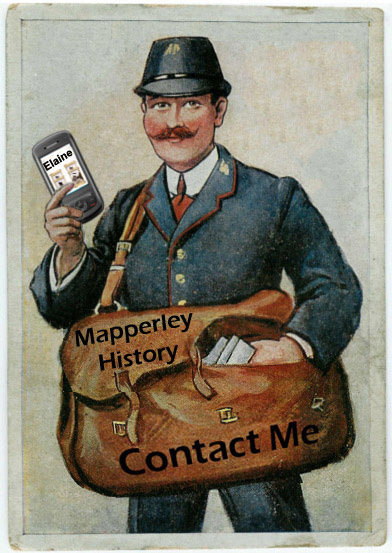 We do Geocaching - which is like a treasure hunt from given coordinates and someone has set one where you have to find about history of things in certain places and two of them involve Mapperley. Once I started reading your site - it was like a good book - I couldn't put it down. I just had to contact you to tell you. Once again an excellent site. What a fantastic website, honestly the best I have ever seen. Well done, you have worked wonders. I have had so much pleasure seeing all the photos and reading all the stories. Hello, I have just discovered these marvellous photos. The little girl at the end of the middle row is me. I lived in Shipley at the time in a house called, 'The Gardens'. I think the year was 1951 as I left Mapperley school when I was 7 years old. I can't tell you how wonderful it has been to look through all these photos and see my lovely old friends whom I haven't seen or heard of since the day I left. Thank you. We hope to visit your village and finding your site I'll be sending my relatives the link - really interesting and informative - thank you. Just looking at your excellent site. I have a photograph which I think will interest you and will send to you. Your site is very impressive, full of interesting stuff, and you are to be commended for all your work on it. Well done. It was nice to read about Mapperley Village in Ilkeston Life newspaper as my grandmother was born in the village and may still have a relation there who could be her great niece, I think her grandma Rose was my grandmothers sister. My grandmother is buried in the church yard under the name of Gertrude Stenson her maiden name was Birkin and the desk in the church was given by her a long while ago, it was still there about 5 years ago. I wish I could be there with you for your celebrations but can't as I live in Cornwall. Wishing you all the best.